Product #60629 | SKU CBK-FS7BK | 0.0 (no ratings yet) Thanks for your rating! 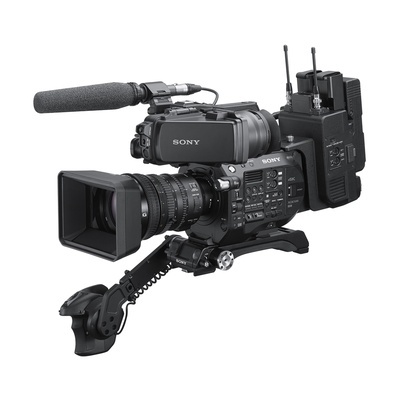 The Sony CBK-FS7BK ENG-style Build-up Kit for FS7/FS7II Camcorder adapts Sony’s ground-breaking PXW-FS7 and PXW-FS7M2 camcorders for shoulder-style shooting typical in ENG (Electronic News Gathering) applications such as interviews and documentaries. The CBK-FS7BK build-up kit includes an extension unit with a wireless audio receiver slot and built-in network capability, providing advanced network operation for broadcast usage; a viewfinder and a cheese plate with enhanced robustness; and an adjustable shoulder plate designed to achieve optimal weight balance. Streaming and file transfers are possible via wireless LAN or 4G/LTE connection. QoS performance streaming is provided through the camcorder’s Dual Link connection, allowing multiplexing of two cellular networks. Ideal for field-based news production, the extension unit adds a wireless audio receiver slot for compatibility with receivers such as DWR series and URX series. Built-in networking enables streaming and file transfer via Wireless LAN or 4G/LTE connection. QoS Streaming with Dual Link connection improves image quality and stability via multiplexing of two cellular networks. Operational flexibility is enhanced with interfaces for genlock/timecode for multi-camera operation and RAW output up to 240fps. Shooting time is extended by compatibility with Sony BP-GL and BP-FL series batteries. The compact, robust viewfinder shares a common design and components with Sony shoulder camcorders for excellent visibility and dependable operation. The shoulder plate features a new sliding mechanism with wide adjustment range, ensuring an optimum weight balance with various E-mount and B4 lenses. Adding the optional LA-EB1 Mount Adaptor (available separately) allows the attachment of B4 lenses to the FS7 and FS7 II, enabling shooting at high zoom ratios with a deep depth of field as typically required for news production. Broadcasters and rental companies can thus maximise use of their B4 and E mount lens inventories, allowing image capture with both a deep and shallow DoF from a single camera.